Musician will.i.am Supports Geospatial Technology and STEM, the Urban Observatory Opens, and ArcGIS Online Gets Analytical. Attendees Leave Inspired. It's not every day that a musician inspires a mapmaker. 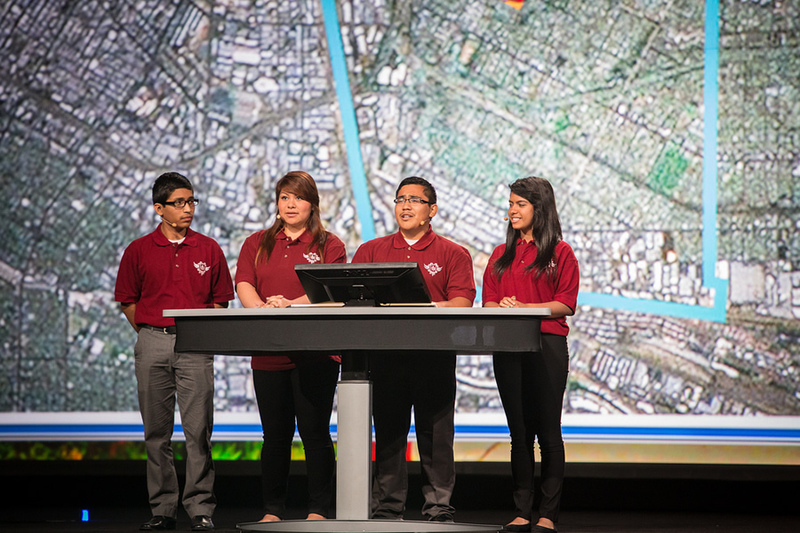 But that's exactly what happened at the 2013 Esri International User Conference (Esri UC) in San Diego, California. It's where will.i.am, the hip hop/pop recording artist and founder of the Black Eyed Peas, gave Katherine O'Brien, the GIS coordinator for facilities at the University of North Carolina (UNC), Chapel Hill, the nudge to commit to mentoring students in how to use geospatial technology. 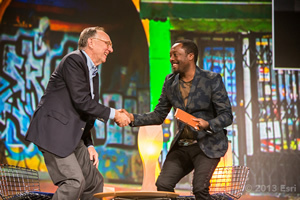 "I need to go back and work with kids," said O'Brien, whose interest in helping young people learn GIS was kindled by a talk given by will.i.am at the Esri UC. He started the philanthropic i.am.angel Foundation in part to support science, technology, engineering, and mathematics (STEM) education in the classroom. Esri president Jack Dangermond spoke one-on-one with will.i.am, born William James Adams, at the Esri UC Plenary Session about his passion for helping young people get a strong STEM education, including learning to use GIS. "GIS maps are part of a new feature of education—getting students to think critically, collaborate meaningfully, and ask the right questions to design real solutions using GIS technology," he said after the students finished their presentation. (Watch the video). will.i.am followed up on that theme. "The maps are really like a filter. They filter information for you to make better decisions on where you are going and what to do," he told Dangermond. "I want to thank you for opening the doors and transforming these kids' lives with these tools." Gini Connolly, the GIS manager from the City of Hurst, Texas, took will.i.am's message of promoting a STEM education to heart. "will.i.am was pretty neat with what he's doing," Connolly said during a visit to the i.am.angel Foundation section in the Map Gallery, where maps from the students' projects were displayed. "He's a change agent." She was touched by his story about growing up in Boyle Heights, a predominantly Latino working-class neighborhood in East Los Angeles, and his desire to help the youth pursue their education and dreams. "He's humble," said Connolly. "Our eyes kind of welled up." 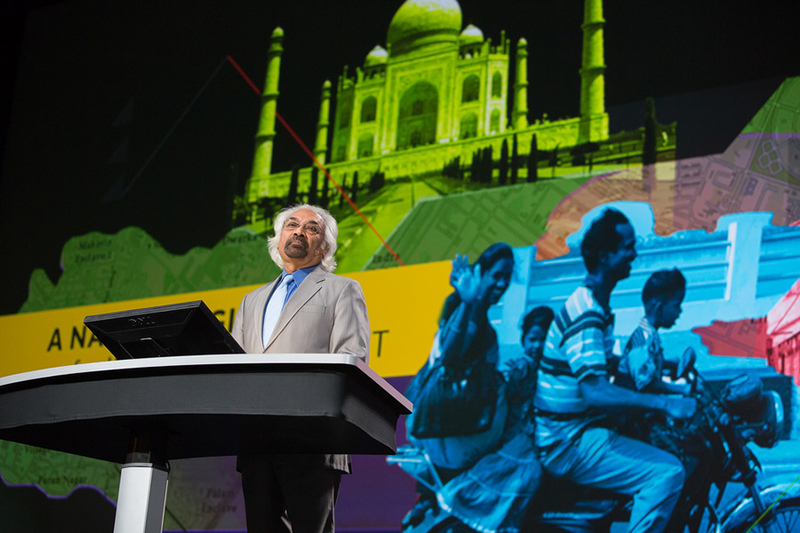 Esri UC keynote speaker Sam Pitroda wants GIS and other technologies to be a change agent in India. Pitroda, an adviser to India's prime minister on public information, infrastructure, and innovations, talked about India's plan to build a national GIS as part of a public information infrastructure. He said 400 million people live below the poverty line in the country of 1.3 billion and that democratizing information using technology will play an enormous role in lifting them out of poverty. Sam Pitroda believes GIS will be critical to turning India into an information-rich society. "We believe a lot of the poverty has to do with the poverty of information. We really don't have information organized in a manner people can use. If we democratize information, I think we can really radicalize our democracy," said Pitroda, who thinks that increased access to information by the poor will lead to improvements in housing, education, employment, health, and justice. "We have a moral responsibility to solve the problems of the poor. And that's where we believe technology, including GIS, is going to help us in the next couple of decades to come." The creation of a nationwide platform for GIS is under way, with plans to use the technology to tag every physical asset in the country and unique identifications (UIDs) for all residents. GIS would be a part of government and public service applications to help streamline everything from the justice system to the food distribution system. A project unveiled during the Esri UC caught the imagination of many who visited the Map Gallery. The Urban Observatory, an idea that originated with Technology/Entertainment/Design (TED) Conference creator Richard Saul Wurman, Ron Kamen of @radical.media, and Jack Dangermond, used geospatial technology from Esri to compare demographic and other information about major cities at the same scale. 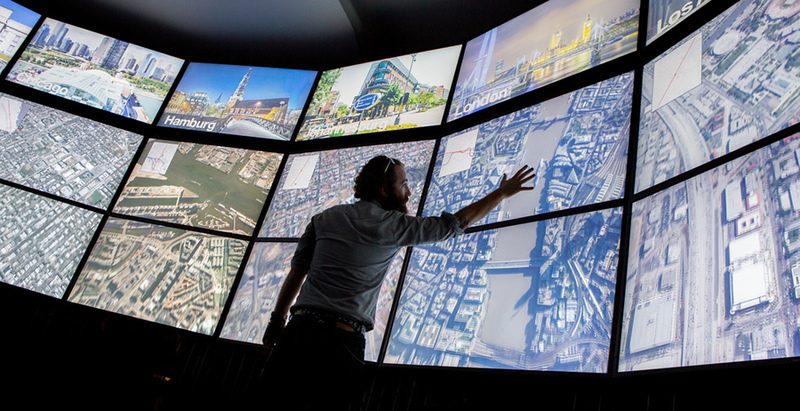 The Urban Observatory operates both as a live exhibit and on a website. Participating cities include New York, New York; Tokyo, Japan; Abu Dhabi, United Arab Emirates; Milan, Italy; Mumbai, India; Paris, France; and Rio de Janeiro, Brazil. A Map Gallery visitor explores the Urban Observatory. Visit the website and find the comparison app, then click on the maps and compare, for example, the population density in London, New York, and Tokyo. You can see where the youth population is concentrated in Chicago, Illinois; Hamburg, Germany; and Johannesburg, South Africa and compare the amount of and location of open space in cities such as Abu Dhabi, London, and Milan. Even photographs taken from the International Space Station (ISS) for each city can be compared side by side. You can select the cities you want to compare and journey through fascinating data about each one including the urban footprint, traffic conditions, and new development. It's a project that involves a type of crowdsourcing. "For land-use planners, this is a gold mine of understanding," Dangermond said. "I think one city could look at other cities relative to their city and learn something," he said in a recent conversation with Wurman. "What can we learn as New Yorkers from Tokyo or people in Tokyo looking at Abu Dhabi or people in Abu Dhabi looking at New Delhi or Rio or Auckland?" Dangermond invites cities around the world to participate. "We think it's so clear and seductive to see things relative to each other that everybody is going to want to come in and play," Wurman said. "Why wouldn't you want to do that from the start? Why wouldn't you [want to] be able to talk to each other and plan together and play together and create together and make better decisions together?" Visit urbanobservatory.org for more information on how to contribute data. 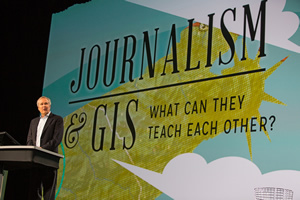 The Atlantic magazine's national correspondent James Fallows' message at the Plenary Session was that GIS coupled with big data can enrich journalism and give readers insight into using what he called "explanatory maps." "In the beginning, journalism was about only words," Fallows said, adding that time and technology brought drawings, illustrations, photography, numerical drawings, graphics, videos, audio, and live streaming into the mix, too. 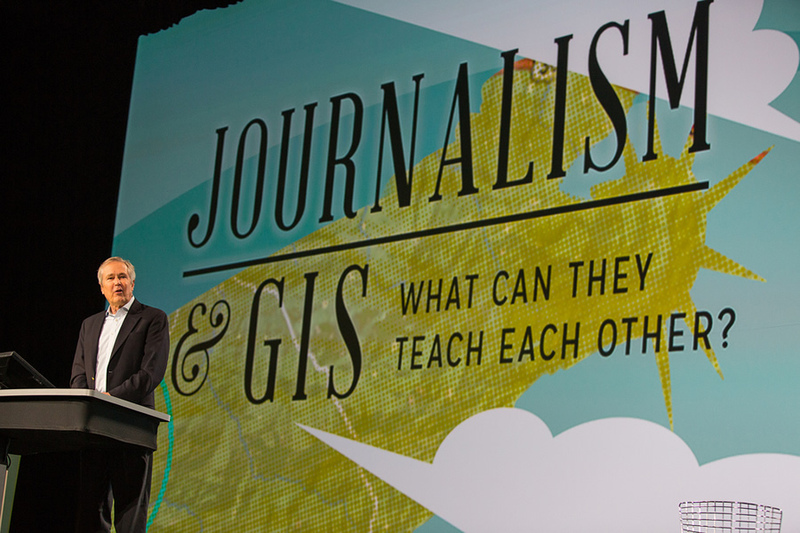 GIS and big data will advance storytelling even more, according to Fallows. "Map-based information has the power to convey, at a glance, relationships that are slow and murky to describe in words, plus the power to reveal patterns that would otherwise lie concealed," he said. Journalist James Fallows will use maps to help tell his stories about small town-America. Fallows will use maps created using Esri technology in his reporting for the upcoming American Futures Project, which will see The Atlantic, Esri, and a radio station collaborate to tell the stories of small towns across the United States. GIS analysis is being used to identify cities with diverse economic and social bases, unusual records of absorbing immigrants, robust school systems, and the ability to cope with economic shock, Fallows said. Traveling by small plane—a Cirrus SR22 that he pilots—Fallows will visit communities such as Holland, Michigan, and Columbus, Indiana. The reporting in The Atlantic will include interactive maps such as story maps. These types of maps are easy to create, said Fallows, adding that he would like to see journalism embrace this new form of storytelling. Fallows grew up in Redlands, California, the hometown of Esri. Dangermond called him "My favorite American journalist." "Jim is working on transforming journalism. I call it geojournalism." "We need to create a better future with GIS." 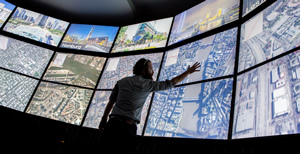 That's what Dangermond underscored in his talk about web GIS, which he thinks will be transformational going forward as geospatial technology increasingly becomes easier to use; more accessible; and can integrate big data, 3D data, and much more. "Look what GPS did as a technology. It totally transformed us as human beings so we are never lost. Nobody's lost anymore!" he said. "Think for a moment if we could make GIS exactly that pervasive so our organizations would not be lost, our communities would not be lost, and our society would not be lost." Lauren Bennett, Esri product engineer on the spatial analyst development team, demonstrated how ArcGIS Online is quickly maturing as a web GIS. 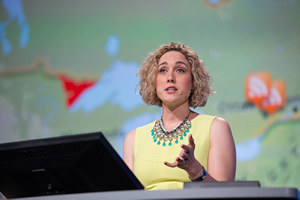 Lauren Bennett of Esri uses ArcGIS Online to do spatial analysis. "At this time last year, pretty much all you could do in ArcGIS Online was make a map," she said. "But over the last year, ArcGIS Online has transformed from a mapping application to a true web GIS." Bennett went on to show the audience how to use some of the new analysis tools in ArcGIS Online, including Summarize Nearby, which finds features that are within a specified distance of features in the analysis layer, and Find Hotspots, a tool that will help you create a map that shows any statistically significant spatial clustering that's in your data. "We are able to answer these common spatial questions using these simple tools in ArcGIS Online," Bennett said. Watch this video to see the rest of Bennett's demonstration, including how she used ArcGIS Online as a platform on which to share information, collaborate, and create a web application. "Clearly, ArcGIS Online is so much more than a mapping application," she said. "It lets us solve problems, it helps us make more informed decisions, and it helps us share our work with the whole world." Dangermond said that these capabilities that were demonstrated will be both in the cloud and on-premises. "What Lauren showed was not just content," he said. "She showed a new workflow using online analytics, and this is just beginning. [In the near future], there is going to be more analytics being put in this environment." O'Brien from the UNC said she plans to work with ArcGIS Online in the future, perhaps on a personal project mapping hiking and biking routes. "ArcGIS Online empowers us to be contributors and not just users," she said. To see more videos from the conference, visit video.esri.com.